Sara Kasdan’s Love and Knishes is both a cultural guide, and a cookbook. Sara Kasdan’s much guide to traditional Jewish cooking (illustrated by Louis Slobodin) first appeared in 1956. The book was rapidly reprinted as it proved strikingly popular with Jews and non-Jews alike who wanted to know how to make traditional Ashkenazi comfort food from matzah ball soup to kugel and mandelbrot. It’s all here, from knaydelach to kugel, and everything in between, including hamentaschen. I should point out that this is a very basic primer for Jewish cuisine; its not fancy, and it’s very down to earth for people who want to make tsimmes, not have one. Note that parts of Love and Knishes is written in authentic dialect; ignore those reviewers who are wringing their hands over the use of dialect. Here, it’s done well, and it’s both authentic and charming, and a mark of affectionate nostalgia rather than mockery. There are many who remember that bubula used just that phrase. There are also those who are offended by Kasdan’s cultural impropriety in including a few standard American dishes of the 1950s; they should get a life and get over themselves. This cookbook was written for the generation that was all about adapting to life in America, yet still missing the food they grew up with. And yes, it’s true, there is an entry in the table of contents for Yom Kippur; if you turn to the chapter in question, you’ll see “Shame! You looked.” What’s not to love about an authentic cookbook with a sense of humor? This is the cookbook I used when I learned to make latkes. It’s also the one I used for hamentaschen. There are lots of copies of Love and Knishes at the usual used book sites (including the first hardcover edition) it is, alas, no longer in print. If you’re looking for a broader, less Americanized take on Jewish cuisine, I suggest Claudia Roden’s The Book of Jewish Food . Roden’s book is a thorough international culinary, cultural and historic survey of Jewish history via a very large selection of recipes, many of which she presents with regional variations. 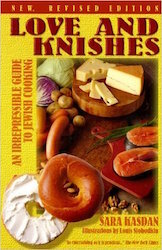 For a kosher survey of Jewish cuisine, see Spice and Spirit The Complete Kosher Jewish Cookbook by Esther Blau, Tzirrel Deitsch, and Cherna Light. For those interested in Jewish desserts specifically, see George Greenstein’s A Jewish Baker’s Pastry Secrets: Recipes from a New York Baking Legend for Strudel, Stollen, Danishes, Puff Pastry, and More .